What it is and what it's used for. Learn more about our proprietary software developed specifically for agriculture. 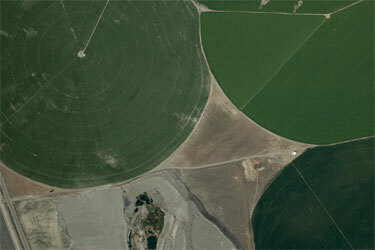 We have provided orthophotos of a wide variety of different crops to agricultural growers across the western states. We can provide the images on any schedule you need, from one acquisition to many throughout the growing season. We provide color, infrared, and NDVI images to allow you to make your decisions with as much information as possible. In addition to imagery, we have created custom apps – both mobile and desktop – to allow our agricultural customers to use the imagery to its fullest potential. Our desktop software uses the imagery we provide to enable a customer to specify variable rate prescriptions for use in precision agriculture. The mobile apps allow growers to bring the images along to a field for on-the-ground analysis of issues detected from the images. The app also provides access to previous years’ images for viewing changes over time. In addition, growers can record notes and send them to their advisers georeferenced to the problem location.